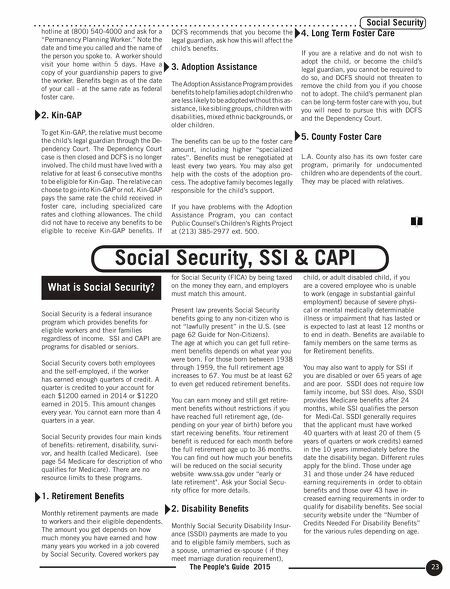 23 The People's Guide 2015 Social Security, SSI & CAPI Social Security What is Social Security? Social Security is a federal insurance program which provides benefits for eligible workers and their families regardless of income. SSI and CAPI are programs for disabled or seniors. Social Security covers both employees and the self-employed, if the worker has earned enough quarters of credit. A quarter is credited to your account for each $1200 earned in 2014 or $1220 earned in 2015. This amount changes every year. You cannot earn more than 4 quarters in a year. Social Security provides four main kinds of benefits: retirement, disability, survi- vor, and health (called Medicare). (see page 54 Medicare for description of who qualifies for Medicare). There are no resource limits to these programs. 1. Retirement Benefits Monthly retirement payments are made to workers and their eligible dependents. The amount you get depends on how much money you have earned and how many years you worked in a job covered by Social Security. Covered workers pay for Social Security (FICA) by being taxed on the money they earn, and employers must match this amount. Present law prevents Social Security benefits going to any non-citizen who is not "lawfully present" in the U.S. (see page 62 Guide for Non-Citizens). The age at which you can get full retire- ment benefits depends on what year you were born. For those born between 1938 through 1959, the full retirement age increases to 67. You must be at least 62 to even get reduced retirement benefits. You can earn money and still get retire- ment benefits without restrictions if you have reached full retirement age, (de- pending on your year of birth) before you start receiving benefits. Your retirement benefit is reduced for each month before the full retirement age up to 36 months. You can find out how much your benefits will be reduced on the social security website www.ssa.gov under "early or late retirement". Ask your Social Secu- rity office for more details. 2. Disability Benefits Monthly Social Security Disability Insur- ance (SSDI) payments are made to you and to eligible family members, such as a spouse, unmarried ex-spouse ( if they meet marriage duration requirement), child, or adult disabled child, if you are a covered employee who is unable to work (engage in substantial gainful employment) because of severe physi- cal or mental medically determinable illness or impairment that has lasted or is expected to last at least 12 months or to end in death. Benefits are available to family members on the same terms as for Retirement benefits. You may also want to apply for SSI if you are disabled or over 65 years of age and are poor. SSDI does not require low family income, but SSI does. Also, SSDI provides Medicare benefits after 24 months, while SSI qualifies the person for Medi-Cal. SSDI generally requires that the applicant must have worked 40 quarters with at least 20 of them (5 years of quarters or work credits) earned in the 10 years immediately before the date the disability began. Different rules apply for the blind. Those under age 31 and those under 24 have reduced earning requirements in order to obtain benefits and those over 43 have in- creased earning requirements in order to qualify for disability benefits. See social security website under the "Number of Credits Needed For Disability Benefits" for the various rules depending on age. hotline at (800) 540-4000 and ask for a "Permanency Planning Worker." Note the date and time you called and the name of the person you spoke to. A worker should visit your home within 5 days. Have a copy of your guardianship papers to give the worker. Benefits begin as of the date of your call - at the same rate as federal foster care. 2. Kin-GAP To get Kin-GAP, the relative must become the child's legal guardian through the De- pendency Court. The Dependency Court case is then closed and DCFS is no longer involved. The child must have lived with a relative for at least 6 consecutive months to be eligible for Kin-Gap. The relative can choose to go into Kin-GAP or not. Kin-GAP pays the same rate the child received in foster care, including specialized care rates and clothing allowances. The child did not have to receive any benefits to be eligible to receive Kin-GAP benefits. If DCFS recommends that you become the legal guardian, ask how this will affect the child's benefits. 3. Adoption Assistance The Adoption Assistance Program provides benefits to help families adopt children who are less likely to be adopted without this as- sistance, like sibling groups, children with disabilities, mixed ethnic backgrounds, or older children. The benefits can be up to the foster care amount, including higher "specialized rates". Benefits must be renegotiated at least every two years. You may also get help with the costs of the adoption pro- cess. The adoptive family becomes legally responsible for the child's support. If you have problems with the Adoption Assistance Program, you can contact Public Counsel's Children's Rights Project at (213) 385-2977 ext. 500. 4. Long Term Foster Care If you are a relative and do not wish to adopt the child, or become the child's legal guardian, you cannot be required to do so, and DCFS should not threaten to remove the child from you if you choose not to adopt. The child's permanent plan can be long-term foster care with you, but you will need to pursue this with DCFS and the Dependency Court. 5. 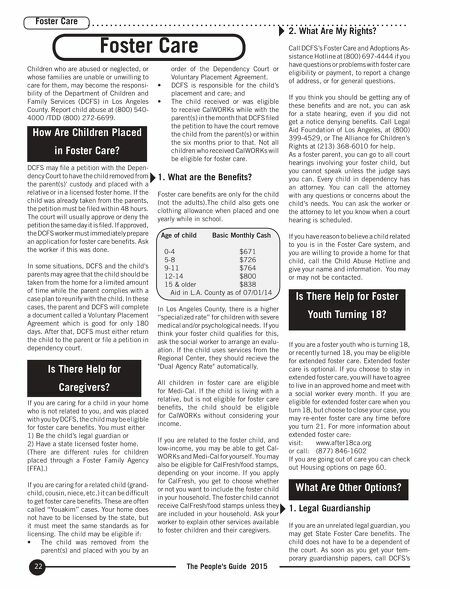 County Foster Care L.A. County also has its own foster care program, primarily for undocumented children who are dependents of the court. They may be placed with relatives.